I love to cook, and really love using fresh herbs. But, with my busy lifestyle, I am always trying to figure out how to grow them in an easy, quick, and affordable fashion. These ideas for repurposed planters for your herb garden don't require a lot of work or space, and look great using recyclables found in my own garage. Last but not least, they are a great opportunity for me to teach my own kids about growing and tending plants. If you're starting your herb garden from scratch, start repurposing from the very beginning. Build your ideal herb garden by collecting old newspapers from your garage or attic and converting them into starter pots for your plants. This is a great activity to do with your kids. 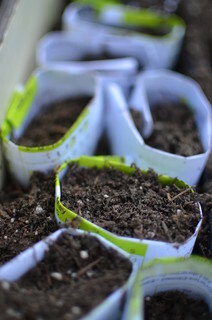 To make the starter pots, use two pages of newspaper and cut them into thirds using a pair of scissors. Roll up each piece using a small can to create a paper cylinder. Close one end of the cylinder but leave a little opening to act as drainage. Carefully remove the can from inside the paper cylinder. You now have an excellent newspaper pot for your seedling. Once you add potting soil and the seeds/seedling, you are good to go. These newspaper pots are biodegradable. Once the seedlings grow to about two to three inches, you can just replant them without tearing off the newspaper. Since you don't have to remove the seedling from the pot to replant it, you don't have to worry about damaging the roots, either. When it's time to replant the seedlings, go on a hunt in the garage with your kids for any container that can hold a plant. It doesn't have to be pretty – in fact, something a bit worn will only add to the charm of your herb garden. These are some of my favorites. Perhaps the easiest item to repurpose, crates are a great way to keep your collection of herbs organized and centralized. If you have an old chest of drawers you no longer use, you can repurpose it for your herb garden. Just pull out the drawers by varying degrees, fill them with soil, and replant your herbs in them. Make sure the chest is already placed where you want it to be, since it will be quite heavy once you fill it up with soil. Maximize space in your home by placing your herbs in an old roof gutter. It doesn't matter if the roof gutters are a bit worn or discolored, since that will help create a warm, cottagey look. Before you start transplanting your seedlings, make sure you've measured your walls and cut the section of roof gutter down to an appropriate length. Display your roof gutter herb planter by mounting it to a wall, or hanging it off the edge of a counter. You can also drill holes into either side of the gutter, and use twine to hang it from the ceiling in front of a window. Compared to a bulky plant box, these gutters are a great space-saver. 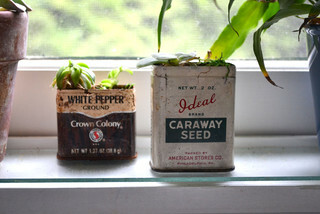 Keep an eye out for old tea tins or galvanized tin pots. These containers can easily fit on a windowsill, and look great all on their own. A collection of tins of varying heights mixed with terra-cotta pots creates a beautiful little vignette in your kitchen. If you don't have much floor space in your home or yard, build up instead of building out. 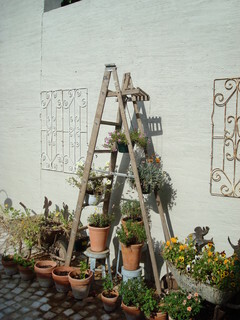 The rungs of an old step-ladder are perfect for holding individual planters. Old shelves can also serve the same purpose. 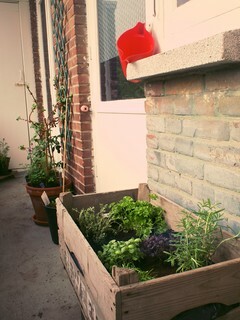 If you have a shelving unit you've been thinking of donating, move it outside and use it for your herb garden instead. Hopefully, these ideas will inspire you to create a planter out of something you find in your home. This is a guest post by Jennifer Lutz, who writes for the Christmas Tree Market Blog. Earlier this year she wrote a blog post about Arranging Flowers which could now come from your repurposed planters.